When it comes to science, empirical data is important. 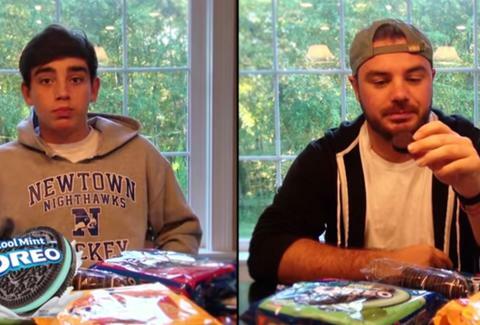 That's why Benjamin Franklin tied a key to a kite, and why these two American heroes -- from YouTube channel Jomboy Videos -- decided to eat 10 new Oreo flavors (in addition to the original, as a control) back-to-back to find out which ones are truly worth your dough. Peanut Butter and Cool Mint Oreos came out on top, and were rated even better than OG Oreos, somehow! Limeade got a pretty visceral negative reaction, and the biggest letdown of the bunch was Cookie Dough, which they described as tasting more like coffee than anything else. But at the end of the day, everyone wins, due to this inspiring application of science. Adam Lapetina is a Food/Drink staff writer for Thrillist, and always has a box of Oreos in his home. Read his musings at @adamlapetina.